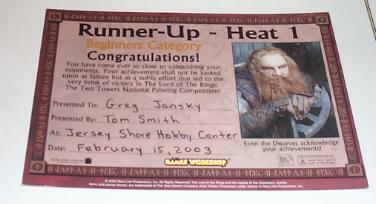 Here's the certificate for my 2nd place model: Weathertop Aragorn. 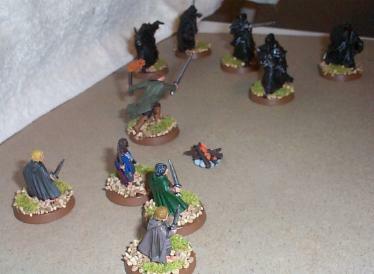 My model was beaten by a Gandalf, though I didn't get a chance to see it. My model beat a lot of Uruk-Hai models, that I didn't think were painted that well. I'm not sure what the winner won, but the winner went to a store in Atlantic City to compete on the state level. Here's the best picture I could take of my model. I can find two faults with it, that may have contributed to the model's not winning. One, I don't like the color of the flames in the flaming brand that he's holding in his left hand. And two, his cloak doesn't have any highlighting or shading to pick out the raised and recessed areas. I still think it's a pretty good model, it looks better in person. 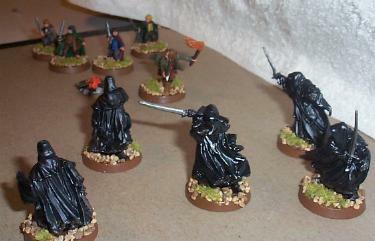 This was the first hero I've painted, and the hobbits from the Weathertop set look pretty good as well. Here are three images of the attack at Weathertop. Since I'm not enterprising enough to build a little studio to effectively photograph the models, you'll have to settle for a bath towel drapped over some pillows.